The accelerated pace of China's exports in August has added to the signs of a gradual recovery, experts said on Sunday. Exports jumped in August by 7.2 percent from a year earlier to $190.73 billion, compared with 5.1 percent growth in July, the General Administration of Customs said on Sunday. But imports increased by only 7 percent year-on-year to $162.12 billion, down from the 10.9 percent increase in July, leaving China with a $28.61 billion trade surplus. Overall foreign trade grew 7.1 percent year-on-year in August to $352.85 billion, compared with the 7.8 percent increase in July. Zhang Liqun, a researcher at the State Council's Development Research Center, said the boost in exports was the result of favorable government policies. China has exempted all outbound goods, transport vehicles and containers from inspection and quarantine fees from Aug 1 to Dec 31. 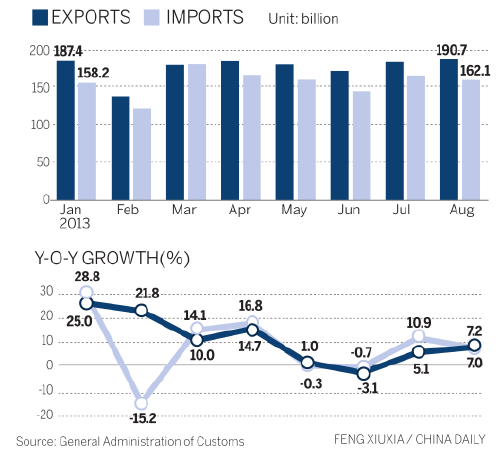 "The 7.2 percent growth rate indicates a clear recovery of exports," Zhang said. Meanwhile, Vice-Premier Ma Kai pledged on Sunday that the government will increase its efforts to open up the market and gradually enhance China's position in the global value chain. Ma made the remark in a keynote speech at the International Investment Forum 2013, a key event in the 17th China International Fair for Investment and Trade. The annual fair, known as CIFIT and held in Xiamen. 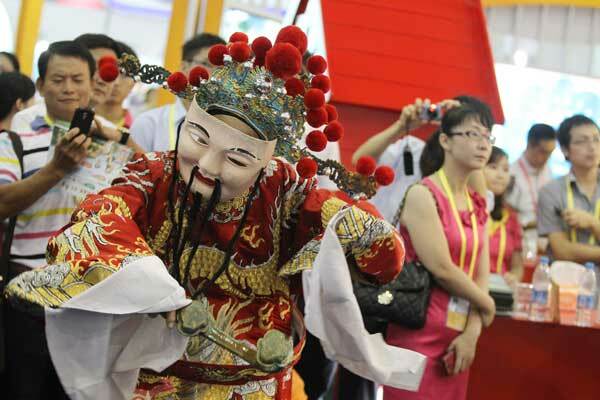 Fujian province, from Sunday to Wednesday, is one of the world's major events to promote trade and investment. Ma said that China is still at the lower end of the global value chain. "Many Chinese exports have low technology and added value, while most enterprises lack core technology and proprietary brands." But Ma said China will quicken the pace of restructuring its economic growth model by focusing on services and emerging industries such as energy saving and environmental protection, new energy and new materials. "We will also improve the quality of foreign direct investment and further facilitate trade and investment. We will speed up establishing free trade zones such as that in Shanghai, and encourage foreign investment to flow into the central and western regions," Ma said. The government will support all kinds of enterprises to go global, he said, and will urge Chinese financial institutions to set up overseas service networks to improve their international operations. "We should stand against protectionism in all forms," Ma said. Mukhisa Kituyi, secretary-general of the United Nations Conference on Trade and Development, said China should increase its overseas investment in high-end manufacturing and knowledge services while encouraging its enterprises to establish overseas manufacturing bases and production networks to better use global resources. "This will not only enhance local employment,but also reduce pressure on China's environment and resources and thus sustain growth," he said. Rintaro Tamaki, deputy secretary-general of the Organization for Economic Cooperation and Development, said China's economic growth will accelerate in the second half of this year, but the pace will still be slower than in past years. Wang Jun, an expert at the China Center for International Economic Exchanges, said China's economic growth in the second half will outstrip that of the first half. He said the upward foreign trade trend in August, driven by the government's facilitating measures and improvement in overseas demand, matches the growth momentum. China's trade with major partners expanded in August, except for a continued decline with Japan. Trade with the European Union, China's largest trading partner, rose by 3.2 percent, while that with the United States, China's second-largest trading partner, rose by 9.2 percent.